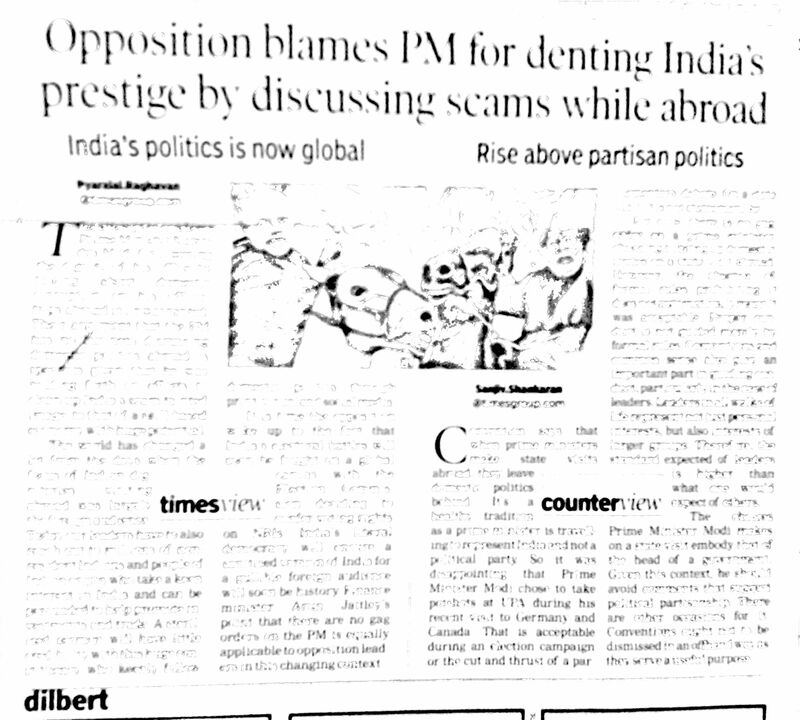 #Congress leader #Anand #Sharma the other day was blaming PM for denting India’s prestige abroad by discussing scams. His contention was Prime Minister represents the entire country and not just the BJP and so he should not have spoken about scams. As a voter I would like to ask this person Anand Sharma where was he when all these scams were being committed and why couldn’t he think of country’s prestige then. For happenings of scams are more embarrassing than discussing scams abroad. He then, was also a cabinet minister and could have ventured into stopping of some of these scams which he didn’t and is now trying to give moral lectures in his much arrogant tone and tenor. The UPA ministry should thank itself that they committed these financial crimes in India which is a soft state, for had they committed such crimes in China or the US many of them would have been behind bars by now and some even executed by the state. That apart the other view point is: The world and more importantly the investors need to be told that the erstwhile dirt and filth created by UPA is now being cleaned up, only to entice investors to invest in India, so what is wrong in that. In fact it was only because of the corrupt UPA regime that the honourable Prime Minister had to break traditions and talk of sanitizing India from corruption. In this day and age of strong media presence every country knows what is cooking in any other countries backyard and Prime Minister Narendra Modi has only done the country proud by telling the world that a neat and clean India has now arrived for them. Leaders like Anand Sharma should show some maturity and not behave like if I may repeat the Hindi proverb: Khisyani billi kahmba noche. Rather, they should take moral lessons on how to be an honest person, like an Indian voter.